The judges on France’s Constitutional Council, a 9 member body, ruled yesterday that bullfighting does not contravene the constitution, rejecting a challenge by the animal-rights group CRAC who seeks to ban the practice nationwide. Although bullfighting is prohibited in certain parts of France, the tradition has remained popular in the south – particularly in the Nimes and Arles areas – for the past 150 years. Professor Diane Marie Amann offered a brief analysis of the Council’s ruling here. CRAC contended that an exception contained in the country’s criminal code which explicitly protected bullfighting—if it occurs in regions “where an uninterrupted local tradition can be invoked”—violates equal protection principles (“The law…must be the same for everyone, with respect to protection as well as to punishment”). In other words, because bullfighting is prohibited in some areas on animal cruelty grounds, the same practice should be prohibited everywhere, otherwise unequal treatment would result. Rejecting this argument, the judges affirmed the tradition exception as constitutionally permissible. But the decision raises the obvious question, what’s so special about tradition? Why should entrenched cultural traditions, however humanly significant, take precedent over the welfare-interests of animals? So how is the killing done? In Spanish-style bullfighting, for instance, there are typically three stages. The first consists of picadors—men on horseback—whose function is to cut into the bull’s neck muscles with lances, for the purpose of weakening him. Next, men designated as banderillas plant harpoon-like instruments into the bull’s shoulder. Finally the matador arrives, the participant who, if successful, will finish off the bull with a single sword thrust—called the estoque—through the animal’s heart. If unsuccessful, the bull’s suffering is prolonged until the inevitable. The whole fight is scheduled to last 20 minutes, but circumstances vary. In my brief description, I have omitted many aspects and details surrounding bullfights, including the pre-fight treatment, other cruelties such as to horses, and various elaborate rituals and “techniques” that, in the mind of supporters, elevate the practice to a refined art-form. Returning to the initial question posed at the beginning, the answer is obvious: Not much—tradition isn’t that special, let alone infinitely so. More pertinent is why entrenched traditions can so easily lead to extreme moral blindness, and what can be done to wake enthusiasts up to the plain absurdities of their convictions. Ethical truths can be a very simple matter, but often getting people to see them – and live by them – is not. Those in favor should have to go thru it first and if still alive at the end then they could give us their irrational opinion. Torture is torture. I witnessed full-on bullfighting as a teen, when my famiy traveled to Mexico. It’s not a pleasant spectacle. you writing this write-up and also the rest of the website is also really good. I think bullfighting is despicable, and while I support the ban some groups are working on, at least one ban has already been overturned. The same was true for the ban on foie gras in Chicago, and they’re working on overturning it in California. So I think it’s important for advocates to also cultivate a new paradigm which truly respects and protects nonhuman interests. It was found under the Native Title Act, that traditional owners were allowed to hunt turtles and dugongs for personal use regardless of the obvious “cruelty” that ensued. I can’t think of a single tradition that’s rooted in bloodshed or killing that should be respected. Bullfighting is simply unacceptable regardless of what historical or “cultural” significance some people attach to it. It’s interesting how rigid adherence to tradition can impact one’s moral perspective. One defender told me that bulls don’t die painful deaths, but glorious ones. It is adherence to tradition? Or more so, that some just refuse to see that which will demand change of themselves? I doubt that these same people hold other traditions with such stubborn zealotry. It absolutely must be the blood-lust. Dying in a fight isn’t a bad way for a bull to go. Bulls of various species sometimes off one another. Sometimes, it even crosses species lines. I know of one case of a bull bison killing a bull elk in a particularly nasty tussle. After all, they start out by cutting the tendons in the bull’s neck, taking away his ability to “sweep” with his horns. 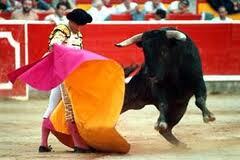 I don’t see how you can say that bullfighting isn’t a bad way for bulls to die. Are you using “bad” in a comparative sense, as in bullfighting isn’t as bad as other ways of dying? If so, I would say that’s irrelevant: there may be worse ways of dying but bullfighting is still pretty bad. My inclination is that the appeal of bullfighting isn’t completely reducible to bloodlust, but that everything else about it—the music, elaborate rituals, community bonding, etc—blind supporters to the raw bloody aspects. People who say things like “bulls are noble warriors” probably believe the rhetoric to a certain extent. I didn’t make myself clear. I said dying in a fight — as in, with another bull, under natural circumstances — isn’t a bad way for a bull to go. Bull elk, bull bison, bull water buffalo, etc. can and do sometimes kill each other while brawling. I don’t support putting a bull in an arena to “fight” a person with a sword. That wasn’t what I was saying. Ah, I misunderstood you HAL – thought you were talking about bullfighting. But in any case, I would still disagree: bullfighting between bulls is a bad way to go, though maybe not as bad as regular bullfighting (I really don’t know). Death isn’t instant or painless, and that’s sufficient for me to believe that dying in a fight is bad. Moreover, Hal, you said “I know of one case of a bull bison killing a bull elk in a particularly nasty tussle.” If the fight was particularly “nasty,” then how can it be not bad? I agree, Spencer. It’s also rare that animal fighting results in death. More often, when one makes a gesture of submission, the fight is over. I think you might be starting to project your sentiments into the natural animal world. Making value judgements on animals fighting, and any pain or death that might result — seems like quite a long stretch to me. Rutting bulls in the wild are quite bellicose, they don’t much care. And yes, Elliem, it often gets quite brutal, and injuries aren’t uncommon. Nature most certainly doesn’t care, Spence. It’s all about keeping the herd strong. The bull that can make it though all the brutal battering of the rutting brawls wins the opportunity to copulate with the cows, and pass on his superior genes. Why should the species of elk, bison, water buffalo or any other such creatures suffer the genes of any bull that might be hesitant about suffering injury, pain, or perhaps even death, in smacking down the competition? Oh, Hell no. Nature favors the strong, the brutal. From the animals’ standpoint it’s all good. Hal, injuries may be common, but so is co-operation and the avoidance of aggression. Unlike us, nonhuman animals almost always kill for survival. We are the only species guilty of gratuitous killing. As you said, “Nature most certainly doesn’t care.” Although the best adapted are more likely to survive, nature doesn’t really favor anything. Strength in animal groups is a by-product of both co-operation and competition. Adaptation favors empathy at least as much as brutal competition. I’m not sure what you mean by: “Why should the species of elk, bison, water buffalo or any other such creatures suffer the genes of any bull that might be hesitant about suffering injury, pain, or perhaps even death, in smacking down the competition?” — but I know that fighting for territory is a fight for survival. Another thought on your post, Hal — are you refering to Dawkins’ theory on evolution, that it’s all about passing on one’s genes? As it happens, I disagree with Dawkins, because I think the conscious interest in survival outweighs any by-product of evolution. Whether they get eaten or lose a fight, It’s not good for humans and other animals to get killed. Other than rough overview of what I see as rather pedestrian atheism that hits on all the predictable cliches and strawmen regarding religion, I’m not aware of Dawkin’s thoughts on anything. I think we’re looking at things from an entirely different perspective. You seem keenly focused on the fate of each particular creature. I tend to view things from the perspective of the entire ecosystem, or cycles of nature. From that perspective, a statement that it’s not good for animals to get killed seems completely out of context. Animals get killed and die all the time. It’s how things work. For example, if a bull elk is killed in a fight, many other creatures, from worms and microbes — to crows and foxes and bears — get to eat. Where is the bad in that? And also, from a species perspective, it makes good sense that only the biggest, strongest, most aggressive males should mate. It keeps the herd and the species strong. And finally, I think you’re ignoring how animals die in nature. A huge percentage are picked off by predators, freeze in spring storms, or otherwise meet death as young calves or fawns. Those “lucky” enough (if one even wishes to use that term) to live to an advanced age most likely face freezing or starving during the next winter, when they become too weak to forage in the snow. Plus, they might be in constant pain from arthritis, tumors, rotting teeth, old wounds, or other effects of age. So, again, as I see it, to be killed in his prime in a battle for primacy, and to never know the agonies of old age in the wild, is not at all a bad way for a bull to go. Your claim that dying in a natural bullfight fight isn’t bad is *also* a value judgment. Mine simply rests on the assumption that suffering is intrinsically bad, no matter where it is experienced, which I find highly plausible. Additionally, you ask where is the bad in a bull elk being killed when its corpse will feed others. There is certainly some good that arises from that: namely, other animals will be nourished. But the fact that sensitive beings have to suffer and die in order to perpetuate life is a sad fact about reality—“Life is suffering” (First Noble Truth). If you agree that suffering is intrinsically bad for the being who experiences suffering, then you ought to agree that it is bad no matter where it is experienced – whether in nature or in human contexts. If suffering is intrinsically bad, then the world is truly screwed — especially within the context of the natural ecosystem and the animals that inhabit it. To follow that thinking through, the entire ecosystem is seething pool of evil. Because by its very function, it inevitably sets up every single living creature to suffer. There quite literally is hardly any way for a wild animal to die that isn’t horrible. And therein, I think, lies the crux of the basic flaws of trying to project our own moral suppositions into the natural animal world. There is a lot of “natural evil” in the world, and so from the pov of nature, sentient beings inhabit a pretty nasty place (hence why the Problem of Evil – in particular the problem of animal suffering – is such a powerful argument against theism). That life is full of suffering is simply an unpleasant fact of reality. I don’t know why this recognition amounts to a flaw. Spencelo, “The problem of evil” hinges upon human conceptions — more specifically a very near-sighted and shallow perspective — and is in no way any sort of an argument against the existence of God. Indeed, IMO, it’s little more than a banal cliche. More probably, evil doesn’t even really exist. Hence, again, I think the flaw in the thinking you’re proposing is, it takes a very forced, narrow and small perspective on things — based upon the projection of possible human wants and desires. It’s like becoming emotionally attached to a single tree, and being heartbroken when it dies, falls and rots — but never trying to see, or even consider, the entire forest. Regarding merely the natural world and the creatures that inhabit it, pulling back and taking a whole-picture view, the ecosystem is wonderful and good. Regarding your comment, I find it ironic that you would charge me with projecting my human wants and desires to nonhuman animals—which I deny is the case—while attributing values such as *being wonderful* and *being good* to the ecosystem. So if I’m projecting, then so are you. But rather than projecting, I merely recognize a basic commonality between humans and other animals: that they both experience suffering and seek to avoid it. It would be arbitrary in the extreme—and anthropocentric—to believe that while suffering is intrinsically bad for humans, it’s not intrinsically bad for animals in the wild. Hal, yes I’m concerned with individual well being because each of us, human or nonhuman, experiences our lives on a personl level. Your view seems to me to be very utilitarian, i.e., the end justifies the means. In my view, utilitarianism is not a moral philosophy, because it condones the violation of whoever is deemed to have lesser value in preference for whoever is deemed to have greater value; and that decision is often made to serve the powers that be. That many animals can gain sustenance from a bull elk who was killed in a fight doesn’t make the fight or the killing moral. I think the best that can be said is that probably neither animal had a choice, except to kill the other in order to survive. If that’s true, then I think neither would be culpable, but it still doesn’t make the killing something moral / good/ right. That nonhumans, like us, will eventually die doesn’t make it right to kill a bull, whether he’s in an arena, or a slaughterhouse, or fighting in the wild. Thanks for telling us about Eric Russert Kraemers Darwin’s Doubts. For some unknown reason, the link didn’t work on my computer, but I was able to find the article when I searched by the title. Np Ellie — I edited the link so hopefully it’ll work now, but glad you found it. Evil is non-existant, insofar as it represents only the lack of something — the lack of good. For further example, hatred does not exist in any self-sufficent sense, it is merely the lack of love. Darkness is a lack of light, sickness is a lack or want of health, weakness is a lack of strength, and so on. Also, again, saying the suffering of any creature is bad, or evil, in the general sense, is mistaking subjectivity for universal truth. For example, a scorpion’s sting might be bad from the perspective of the creature on the receiving end, but it’s good for the scorpion — both as a means of defense, and getting food. In other words, all ends are ultimately good. So, again, evil isn’t a “problem,” and in no way contradicts either the existence of God, or God’s creation being essentially good. What are we going to do? Chastise the bull that injures another for being immoral? Or, perhaps lecture both about the immorality of fighting in the first place? Animals struggling for primacy in the wild isn’t something you and I can either support or oppose, like a human social issue. It’s simply there, and it is what it is. My only observation is that to the ultimate end of keeping the species strong by way of competition for access to copulation with the females, it’s good that bulls fight, and the best and strongest win. Putting a domestic bull into an arena to “fight” a man with a sword all hinges upon conscious human decisions, and, IMO, represents no end, other than the ego of the bullfighter, and the entertainment of the crowd. I can’t resist making a small comment about the PoE, which you’re so quick to dismiss. The PoE is an argument that philosophers of religion (both theists and nontheists) take very seriously, and defining “evil” as “the lack of good” won’t work because, as I mentioned, it can be recast in the language of suffering. One extremely sophisticated version can be found in Knowledge of God, a book co-written by Alvin Plantinga and Michael Tooley. As for my claim about the intrinsic badness of suffering, I’m merely saying that suffering is bad for the creature who experiences it. You appear to agree when you say a scorpion’s sting is bad “from the perspective of the creature on the receiving end.” That’s what I mean, and why I disagree with your previous claim that dying in a natural bullfight isn’t a bad way to die—it certainly is for the “loser” bull. So I don’t see why this observation requires any “projection” on my part, in the sense that I’m misrepresenting reality. Suffering is suffering, no matter where it occurs. It’s a terrible fact about nature that tremendous suffering and death must often occur in order to sustain life. Hal, I think if you read my post more carefully, you’ll see I didn’t say two bulls fighting each other for survival is immoral — what I said is the likelihood that they had no choice doesn’t make the fight or the killing moral — neither moral or immoral, in my view. I think that like us, nonhumans have a right to belong to themselves and they deserve the same moral consideration we apply to our own species, which prohibits us from causing them gratuitous harm. So I agree that it’s not our place to support or oppose what they do to survive — but I also think we are wrong to harm them outside abject survival and unless non-lethal measures have been tried. For example, I think humans who live in remote societies, and who have no other way to survive, are not wrong to kill nonhumans for food, but neither is it moral. It’s amoral, imo, because it’s either death by starvation for one (in this case humans) or death by a predator for the other. The same is true for nonhuman predation, and I find it horrible and cruel, but that’s how life evolved on this planet. In contrast, when humans kill other animals for an unnecessary food — either directly or by slaughterhouse — or for some crazy concept of a sport in the wild or in an arena, etc., they do indeed commit gratuitous harm, which is immoral. It boils down to perspective. Having once been atheist myself, I’m not terribly impressed with it, and neither do I see much actual substance in the “problem of evil” argument. All it’s doing, is trying to universally apply immediate, subjective perspective. Also, you talk about death like it’s a bad thing. We’ve been trained and conditioned by society to loathe and fear death. To see it as the “end.” Not hardly. Again, perspective. From a certain perspective, we haven’t even been born yet. The only “bad” in what we call death, perhaps, is missing somebody who has gone on, while you’re still here. But that’s only temporary. We as finite beings are hardly in a position to adequately decide what “perfect” would even be in the first place. Hitler probably had his idea of what a “perfect” world would be, after all. As did Chairman Mao, and perhaps so did Mother Teresa and Woodie Guthrie. Who knows? They aren’t here for us to ask them. So, who the heck is any person to say the world is bad, evil, incomplete or imperfect, because animals suffer? Maturity and wisdom comes, I think, in moving beyond that, and seeing the futility in trying to figure out what might make a perfect world, and consequently, in convincing oneself and trying to convince others how screwed up and awful the world is. That’s no way to wake up in the morning. I think I’m past the point in my intellectual and spiritual development where the sorts of arguments you’re presenting are going to make much of an impression on me. I’ve heard it all before, and it’s, IMO, ultimately pedestrian and unconvincing. Besides, we’re getting way off track here. I see no point in the spectator point of bullfighting, and tradition be damned. Therefore, I do not care for it. Therefore, I would not pay money for a ticket to witness or support it. Thanks for clarifying your position. I agree on some points, don’t agree on others. For instance, I oppose wanton animal abuse, but I don’t agree in giving animals the same moral consideration as humans. Neither do I worry about animals doing what the do in the wild. A bull killed in a fight during the rut went out doing what he does, by his own instinct, and ultimately for the greater good of his species. There’s nothing to be upset about. I respect your right to hold your moral views, but don’t feel compelled to follow them. Just as I would not expect you to follow all, or any, of the tenants of my religious or moral code. On the subject of bullfighting, as I just told Spence, I see no real point or end of greater good in it. It just makes a public spectacle of tormenting and killing an animal. Hal, while I agree that neither of us is compelled to accept the other’s view, I’m also certain that morality is not a matter of opinion or cultural acceptance, and that absent empathy, morality is vaccant. In general principle, I agree. However, the rub comes in discerning the distinction between empathy and misplaced sentimentality. The latter can hinder the sort of detached, rational thinking upon which I think justice and morality rest. Or, to put it another way, empathy in and of itself is a virtuous and praiseworthy quality, but it must be kept in perspective and in its place. It is but one tool. And as the old saying goes, if all you have is a hammer, all you’re going to be able to see is nails. I will say that I believe it’s a consequence of my view—that nature is often horrible and cruel due to (for instance) predation—that humans, if possible, ought to radically intervene in nature to alleviate suffering. So I do worry about what happens to animals in the wild, but hopefully I’ll say more about that in a future post. I simply don’t see any intrinsic wrong or badness in creation. I would also have great pause over the idea of us meddling with the wild in such a manner. Unless, for example, to mitigate the effects of an oil spill — which is our fault, and is hurting wild animals.